A stunning and highly decorative whole floor of an important and imposing 15th century palace on the elegant Campo Santo Stefano in San Marco with extensive reception rooms bedrooms and bathrooms as well as an internal divine galleried terrace . In addition a mansarda floor with further bedrooms and bathrooms, access to an altana roof terrace . 6 bedrooms and 5 bathrooms. The property is accessed by its own front door at ground level from the campo and is a completely private entrance ( porta sola ) with private wide staircase up to the first floor. There are magazzini (storage rooms) at ground level as well as a second entrance leading to a side canal for easy boat access. The palazzo dates from the 15th century with later additions. 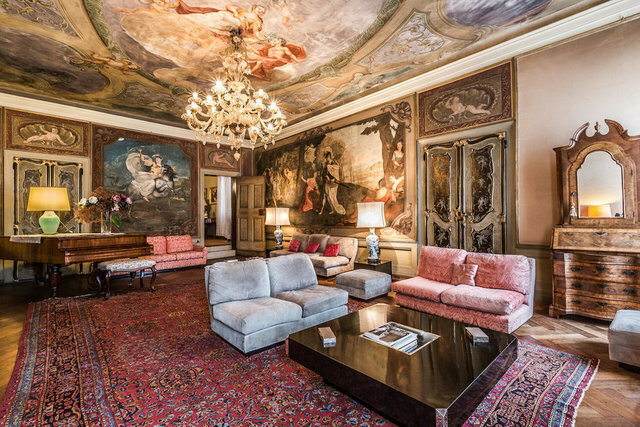 This exquisite apartment is decorated with stunning 18th century frescoes and paintings by Pietro Perotti under the protection of the Belle Arti. Perotti exhibited at the Royal Academy and lived in London between 1772-1775. He was married to Angelica le Gru who was a pupil of the famous Italian artist Rosalba Carriera.